(STATEWIDE) – With Texas State Technical College rapidly growing and the demand for a skilled workforce increasing, TSTC is hiring to fill more than 200 positions by 2019. The ideal candidate is someone looking for a career change or transition and will have a passion to share their technical and industrial field experience in the classroom. Depending on the position, the applicant will need to have one to five years of work experience in their industry, along with an associate degree or higher. Some teaching or training experience is preferred, but not required. Faculty positions in high demand technical programs such as Welding Technology, Precision Machining Technology and HVAC Technology are needing to be filled. There are also openings for staff in the areas of recruitment, information technology and the TSTC police department. A TSTC System employee is eligible to receive a competitive salary; benefits that include health, dental, vision, paid sick and vacation time; flexible spending accounts, retirement fund options, employee assistance programs and employee discounts, as well as a respect for employee work-life-balance. 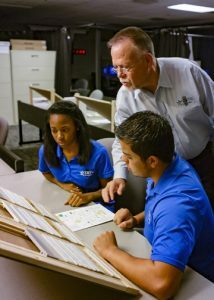 TSTC’s mission is to contribute to the educational and economic development of the state of Texas by offering technical programs and supported academic coursework. TSTC is made up of 10 campuses across the state and has been training and placing Texans in great paying jobs for more than 50 years. Employment applications are already being accepted with the interview process beginning immediately for many positions. The positions are expected to be filled by January 2019. For more information or to apply, visit tstc.jobs or call 254-867-4810. This entry was posted in All TSTC on December 3, 2018 by Amanda Sotelo Sotelo.